Feed digestibility and ADG (average daily gains) for ruminants and poultry increases dramatically. The concept of low cost, low tech, low impact on electrical and other processing resource use, low maintenance, low skilled and high output results have shown this concept to be a winner. An entirely vertically integrated plant starting at raw corn and soy bean and roughage level to completely processed and balanced feed. It has been proven during the 1960’s by TW Perry that 8% more rapid gain is experienced when using roasted vs raw processed maize. The hectolitre mass of roasted maize is some 12% lower than raw maize and with 5-7% lower moisture, resulting in lower intake of grain and higher daily gain through better conversion of the same amount of dry matter. The digestibility and acceptability of roasted corn is much higher. Soy beans are similarly roasted for higher conversion rates of protein and fibre releasing the trypsin inhibitor to protein uptake in ruminants and poultry. Roasting of soy beans / and or maize – optionally expelling of oil from soy beans. Loading either in bulk or in bags. Labour: 4 persons at farm labour rates of R10/hr = R40 per ton. Total ingredient cost: R3,500 per ton *. Average selling price of broiler finisher* per ton: R5,000 per ton. Estimated cost of plant, delivered and installed: R1,750,000. It is therefore clear that the large scale farmer can save some R270,000 per month for mixing his own feed and an individual entrepreneur may have a lucrative business opportunity in installing an ABC Hansen Mini Feed Mill. At a cost of around R1,5 million ex works Pretoria for a complete integrated mill from reception of grain notably maize and soy beans, through storage, processing of soy beans, milling, blending, pelleting and packaging including electrical control systems this offers great value for money at a capacity of more than 1 ton per hour. **The above layout excludes equipment listed above such as intake, storage, roasting, various bins easing the production flow into a less labour intensive operation. On site feed mixing reduces feed costs, allows home grown grain to be used, facilitates effective raw material control and allows for continual adjustments in the mix in response to animal growth rates or changes in raw material prices. Experienced feed mixers can achieve very low cost per unit of feed and reduce the incidence of disease. Producers with a mill at their disposal always know the quality of their feed and are able to adjust their feed structure to their animals' needs, quickly and easily. Silos to store raw materials. Unload systems from silos into holding bins through cleaning systems. Feeders of correct design to draw materials from holding bins to hammer mills. Weigh hoppers to pre-batch various raw materials. Batch making software and control systems for automated recipe execution into pre-blending bins. Hippo hammer mills or UMS disc mills. Blenders and post blending bins for fast turnaround in blenders. 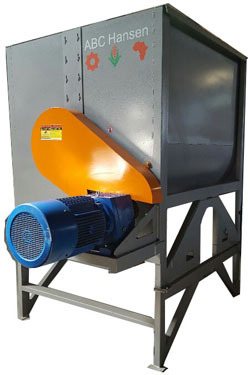 Pellet machines and crumbling plants for in house use or high quality pellets for resale, demanding intact survival over long distances and much handling. Bagging plants, entirely automated or semi automated or manual. Extruders for soy bean and other oil seed processing, dog food and fish feed extrusion as well as mechanical oil presses to lower oil levels in oil seeds in order to obtain maximum protein. Intake systems for maize, soy beans and other grain & legumes. Conveyance to silos, either flat bottom or hopper bottom live bottom bins in the case of oil cake. Unload systems to extrusion and expelling plant if already processed oil cake is not bought in. Milling of grain in either a Hippo hammer mill or a UMS disc mill is used after the grain has been cleaned. Dehulling of the beans after cleaning and prior to milling into a grit. Extrusion with an InstaPro extruder and if low fat meal is required, an InstaPro expeller is used to mechanically express the oil to a residual level of around 6% and with high protein levels. Sunflower or other oil seeds may also be used and would generally follow the same line as with soy beans. The extruder and expeller may however be differently configured for high content oil seeds versus low content oils seeds such as sunflower vs soy. Storage and conveyance of bales. Liquid molasses and acid oil dosing. Vitamins and mineral including dosing. 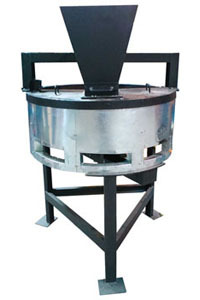 Pellet or cylindrical briquette machine. Conveyance to final product bins or bagging. Briquette machines can produce 40 - 90mm cylindrical feed briquettes with longer fibres than pellet machines are able to produce. These machines are also much more economical to run in terms of energy requirements. Large animals and even sheep and goats find no problems in consuming briquettes, particularly if the briquette is not pressed too tight and hard. Briquettes would not be suitable for ostriches. Pellets on the other hand are easy to handle, store, transport and bag. Less waste in the consumption process is also likely. Poultry plants would include the intake, storage and milling sections as well as the soy processing plant if oil cake or full fat soy meal is not bought in. The pre-blending and blending sections would be the same and all product would generally be pelleted and crumbled for starters and all other rations including that for layers, as crumbs would always be preferred above a mash. Hay processing would not form part of this plant. Pet food would require the same intake and storage for grains and soy beans. Other protein sources such as blood meal and carcass meal is normally sourced in bags and depending on the scale of the operation, may be either taken into a bulk hopper type silo or may be added manually into the pre-blending bin via a conveyor. Soy processing takes place as above with usually low fat soy oil cake produced while the processor may elect to use full fat soy bean meal. The final blended product is then extruded with an InstaPro extruder with extrusion die of the processor's choice and cutting head after which the product is dried and cooled and packed, ready for shipment. Fish feed is categorized as either floating or sinking pellets. Soy bean processing and grain processing would take place as described above while extrusion would be typically the same as for pet food as described in the section above. The key to good end products are high buoyancy of extruded pellets, minimum waste, maximum feed intake and conversion rates. Visit www.insta-pro.com for more technical information about extruders and mechanical oil presses. Feed Milling: Why pay pub prices for the feed cocktail? What every livestock enterprise is doing, whether for cattle, poultry, pigs or sheep, is converting a cocktail of mainly carbohydrates, fibre, protein and trace minerals and vitamins into meat. And that’s the beginning and the end of it. The efficiency thereof, determines whether the enterprise is profitable. The livestock farmer is really a trader of carbohydrates and protein and if he buys the cocktail from the feed mill, he pays O'Hagan's bar prices as opposed to paying Makro's wholesale prices for the ingredients. Why not mix the cocktail yourself? The feed mill has to earn at least 30% gross profit for it to be viable and a big portion of that can be money remaining in your pocket. An ABC Hansen system can be more, or less automated. With a manual batching system, it would require the intake of maize (or another grain with quality carbohydrates) in bulk dumped inside a shed from where it is worked into the hammer mill manually. The milled grain is then bagged at 50 kg. and stacked. Other ingredients are similarly milled while bagged inputs not requiring milling are also stacked. 20 kg other ingredients, proteins, vitamins and minerals with a carrier. After mixing, the product is transferred to the pellet mill with a screw conveyor with speed control and then pelleted, cooled with a cascade cooler and bagged through a mechanical tip-scale. Automated batching with electronic or mechanical batch controllers and load cells can be introduced at any time and hopper bins and silos can automate the process to the extent that suits the operation. It has been clearly established that pelleted feed ensures less waste and avoids selective feeding and allows for higher daily feed intake and therefore higher daily gains. And, after all, that is what it’s all about! And at only around R350,000 over 5 years it means less than R23 per ton on capital cost, around 60kWH and 4 unskilled job opportunities for a business with a turnover of around R700,000 per month. If you have been buying feed for yourself, you would save around R150,000 per month off your monthly feed bill, depending on how well you can buy raw materials. Even more if you use your own grain and you add a silo! Think you can't figure out a good ration? ABC Hansen can assist you. And the cherry on top is that the S.A. government would pay you to do this at around 30% of the capital cost including vehicles and dedicated buildings if done within its borders and ABC Hansen will assist you to get the money. Below is a representation of what a ABC Hansen mini feed mill looks like. (Some items shown may be optional). A major advance in feed milling is the complete PTO tractor driven feed mill from ABC Hansen. This mill utilises the tractor's PTO to drive the General Dies pellet mill which in turn has a power generator built in, to power two to three moresmall electric motors. 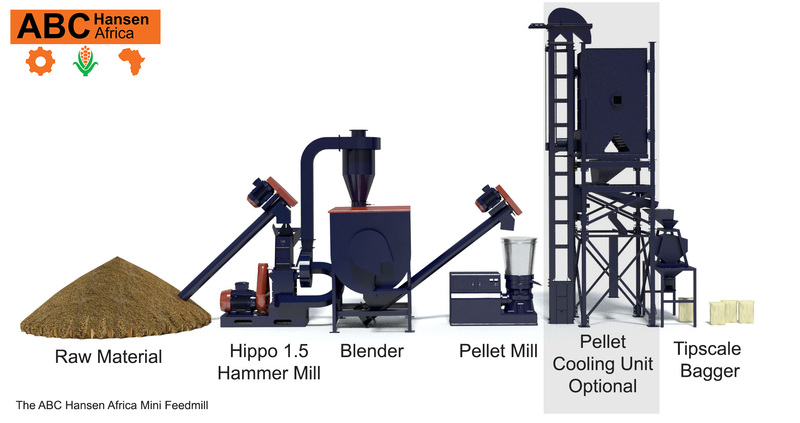 The entire mill consist of a Model 47 Hippo hammer mill powered by a 20HP diesel engine for milling a batch of ingredients and filling the vertical mixer by an auger (both auger and mixer hydraulically driven from the tractor). The mixed product is fed into the pellet mill with an auger (powered by the pellet mill which is in turn powered by the tractor PTO) and the pellet mill output is lifted with a bucket elevator which cascades through a cooler and manual tip scale bagger. The capacity of this plant is in excess of 2 tons per hour with maize based feed and the farmer can start the system whenever needed for a few hours per day utilising an old farm tractor with +- 75kW capacity. Pellet mills are integrated in most feed milling operations. ABC Hansen includes the following pellet mills in its systems which it either manufacture or support. Pellet mill capacities are always given in a range. This would depend on the type of product pelleted ie. alfalfa or hay - which are always the low end of the capacity vs maize or other grain which are at the high end of the capacity. Other factors such as the size of the pellet is of course also relevant with larger pellet diameters achieving higher capacity per hour albeit not in a direct relationship. The more important determinants of pellet quality is to match the correct compression to the pellet feedstock. Compression is determined by the thickness of the die and the amount of the taper in the hole of the die as well as the depth of the counterbore. 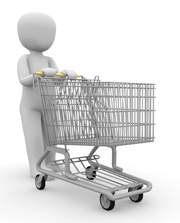 For new products, these details would have to be obtained through experience and testing. Testing facilities are available at a small refundable charge. Alfalfa 20/25 kg per kw installed. Wood sawdust: 330 kg per hour. Poultry feed without steam 1,200kg and with steam 2,400kg per hour. Alfalfa 600 kg per hour. All capacities indicated below are for pellet mills without steam added. Approximately 2-3% steam is normally added to products with a 12% moisture content. In the case of for instance compost, no steam should be added as its moisture can be up to 18%. Depending on the capacity, a 8-10 bar steam generator, supplying around 2.5 bar dry steam is required with about 5% capacity of input to allow for some margin on the minimum 2-3% steam requirement. These mills are supplied in one capacity only namely 800kg to 1,200kg per hour depending on feedstock. For poultry feed the capacity is between 1.2 and 1.5 tons per hour depending on the die size while for alfalfa / maize pellets the capacity would be closer to 800kg per hour. The acquisition cost is low, the dies are cheap and easy to replace while replacement is more frequent due to the higher wear the roller places on the flat surface, especially on the inner part of the die. The mill runs on a 22kw to 30kw motor. In some cases flat dies can be turned around depending on the designed compression. Probably the only European manufacturer of pellet mills and dies still operating from Europe, is General Dies. Most other manufacturers are now manufacturing offshore - mainly in the Far East. After 50 years of manufacturing top quality pellet mills and dies, and with more than 2,000 pellet mills in the market. General Dies is one of the major pellet mill companies in the world. Visit www.generaldies.com. Less intense torque on the shaft when starting up due to elasticity of the belts. Less costly than gearboxes and less wear. Two or three knives inserted from outside the machine are used.